This entry was posted in Competitive Analysis, History, Risk Management and tagged Charts, Mining Stocks, Structure of production, Technical Analysis. Bookmark the permalink. 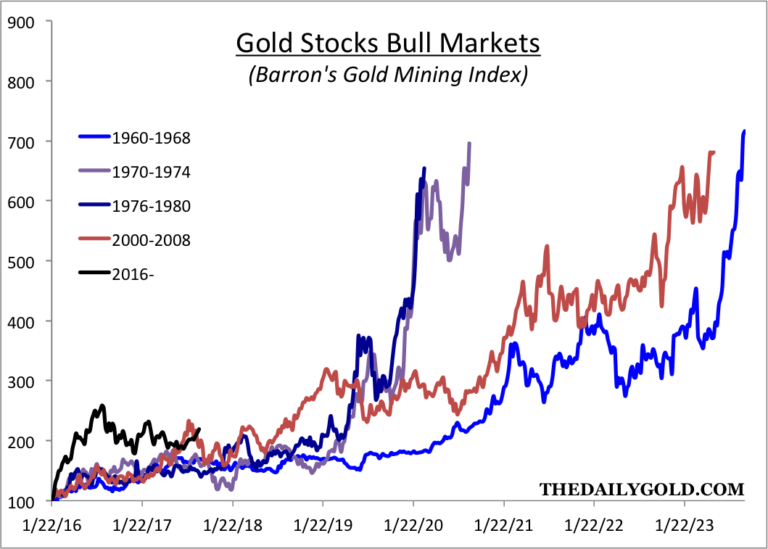 Really, the only thing that charts tell me about the mining industry is that it is extremely cyclical and that the bear and bull markets can be quite severe. The main thing to learn from this is the power of mean reversion. OK, Daniel, you mention the most apparent conditions–don’t overlook the obvious–but can you look a little deeper? What are unique about the cycles especially this last cycle? My thoughts on the first two graphs are that they cover a gold bull run and the period just before. The period just before has been flat and based on that they come to the conclusion that every flat period could be followed by a bull run. To get a more accurate picture one would need to look and see if there are other flat periods that were not followed by a bull run. 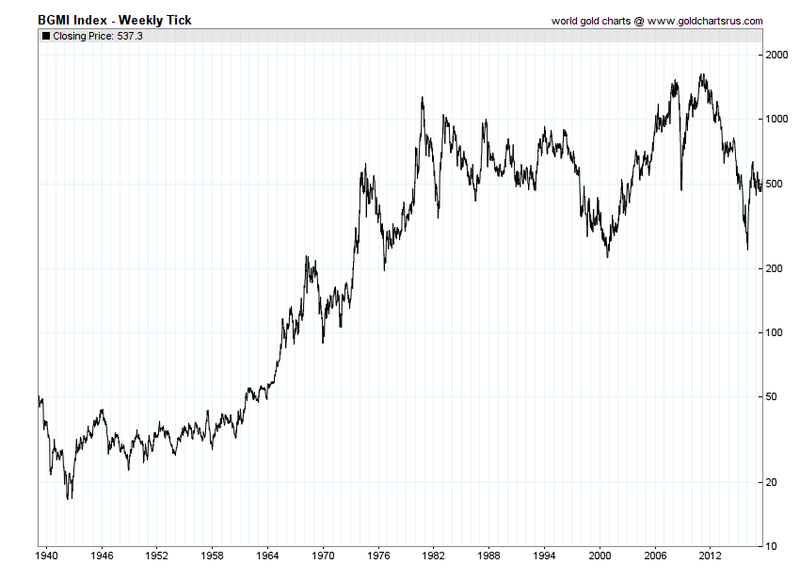 The graphs showing that gold stocks were at their cheapest ever is more interesting. They are cheap in relation to historical prices but are they cheap at an absolute value? It is well known that the mere fact that stocks get cheaper creates selling pressure and that is due to psychological reasons so I believe that chart is more promising. The banking/housing chart shows that there is a great relationship between the two but that is not really of much help. The important thing is if you can predict which direction they are going next. However, they show that at least during that period – July 2012 to 2017 – they have gone the opposite direction. That makes sense since banks and the housing sector prosper in good times and gold thrives in bad times / in anticipation of bad times. But the case is the same here as above, the mere fact of knowing this is not sufficient. The question is whether you can predict the next direction of the economy. 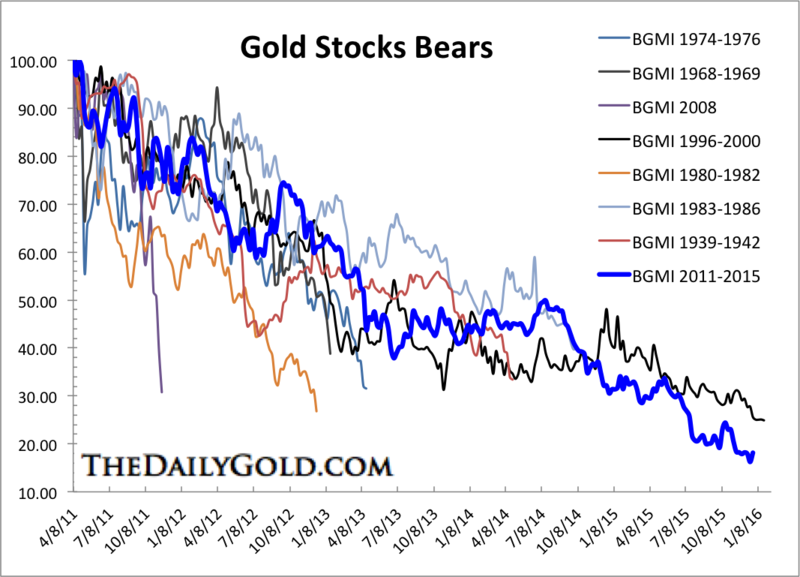 It looks like gold could be useful if you want to invest in housing/banking and want a hedge. I read a very interesting study about asset allocation. The article might have been posted here. It showed that if you had always maintained a certain percentage of your portfolio in gold you would have outperformed an index fund by quite some margin. Oh well, I might not have phrased the question properly or given good examples. Google for the free pdf or on this site. OK, but it’s 400 pages long. Where do I start? Read the table of contents and skim where the book describes the structure of production. I understand that they are talking about the structure of production. That is, the stages where different things are turned into different products. This includes various stages where value is added and the importance of time is also mentioned. They mention how goods are destructible and what is not is land. Iron ore is mentioned in regard of producing other goods such as pins, railways, buildings or whatever. Here I think the comparison with gold ends. Gold is sometimes added value to but for the greater part it is just stored as gold. 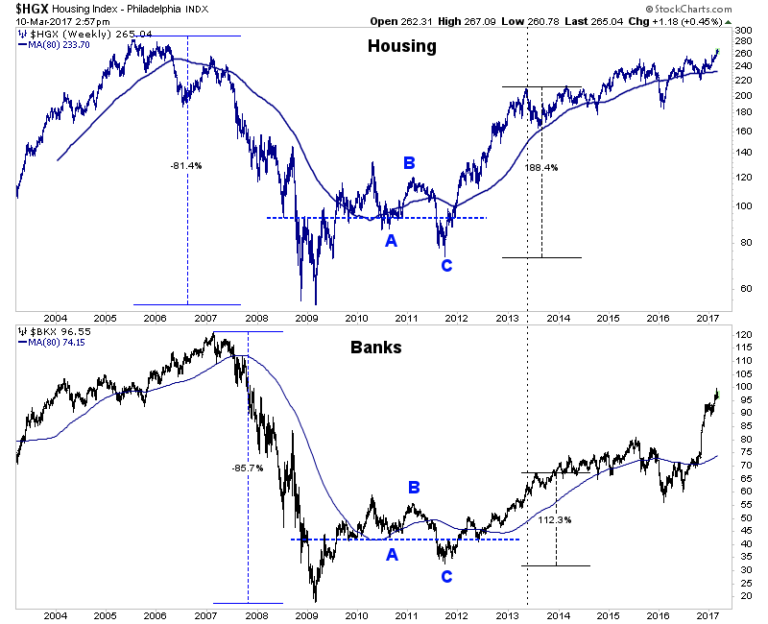 Housing and banking is fundementally different and perhaps that explains the difference in the charts? The importance of inventories is also briefly mentioned. That a build up can be related to a recession. I can see how that would relate to housing but less sure about banking and gold. It’s a complex text but a great read. I can’t analyze it in more detail until next week. Would you like to share how you use its content to analyze the charts, please? Ok, but let me have a few days to let someone else think about it. Here is a hint. Imagine you are on a giant swing 15 feet off the ground with a thirty foot board. If the swing were to move up and down violently and you HAD to sit on the swing, where would you want to sit–near the middle of the swing or out at the end of the board? Middle I suppose. Makes me think about the business cycle. Looking forward to hear your answer. If you look at the structure of production, you see that mining resources would be far away from the ultimate consumer. If you want to lower volatility in your portfolio choose consumer nondurable companies–though today companies like Campbell Soups P&G show rich prices and poor future returns–in my opinion. It takes an average of twenty years from discovery to production; it takes one to two years to shut down a mine and perhaps more to reopen a mine. Thus the cycles and spikes are longer and more pronounced IN GENERAL than other markets. I am not saying the structure of production is the only factor (interest rates/capex), but note the difference in the long-term chart patterns. Maybe I am reflecting my bias–but I use charts in this way. The booms and busts in shipping are more sudden and shorter because of the two to three year time frame to bring on new ships. John, I believe that the time spans you chose for the above charts show your bias. 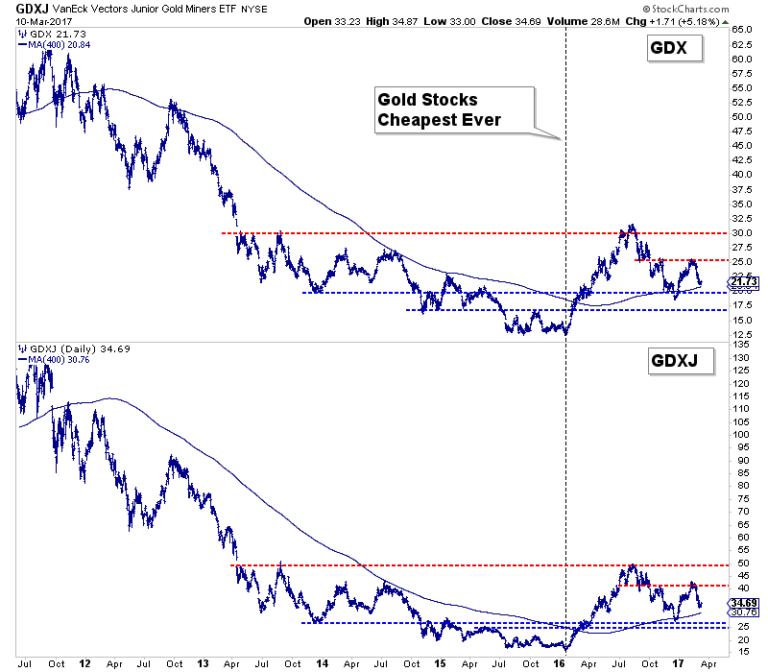 If you line up the times for the gdx/gdxj/housing/bank charts, you would see that the gold stocks recovered much more quickly and severely directly following the 2008 financial crisis than the housing/bank stocks. Regardless, how would you adjust your investing strategy with gold miners, based on your ideas? To me, it wouldn’t affect my strategy one bit. 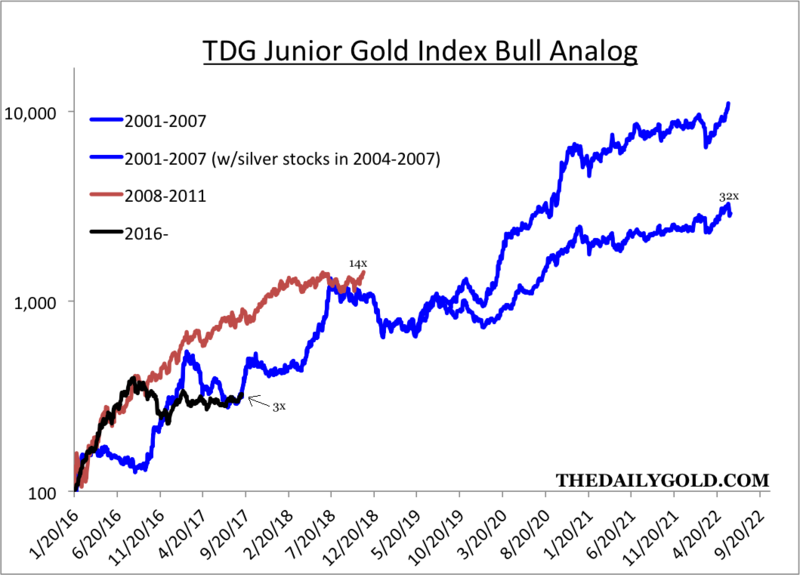 It would seem to me like trying to market time if you decide to wait a while before buying anything in a gold stock bear market, because you believe you’re going to have plenty of time before the subsequent bull market. I am biased–unfortunately–it is part of my human condition. As a strategy, I would combine my knowledge of the structure of production with the amount of capex/over depreciation to determine ROUGHLY the time needed to adjust. market if you count the bottom Feb/2016. Miners need $1,700 gold to do greenfield exploration. In a nutshell, I am more likely to be extra patient holding positions in this highly cyclical industry until I see large amounts of capital reenter. Thanks for keeping me honest, but I will always be biased. Let’s hope not blinded by bias. Gold companies are impacted twice by interest rated and therefor any increase in rates impact them double. In addition we have managers who only focus on their salaries and bonuses. Mine supply of AU is not that big big an issue and closing of mines does not impact the same as with other mining companies.